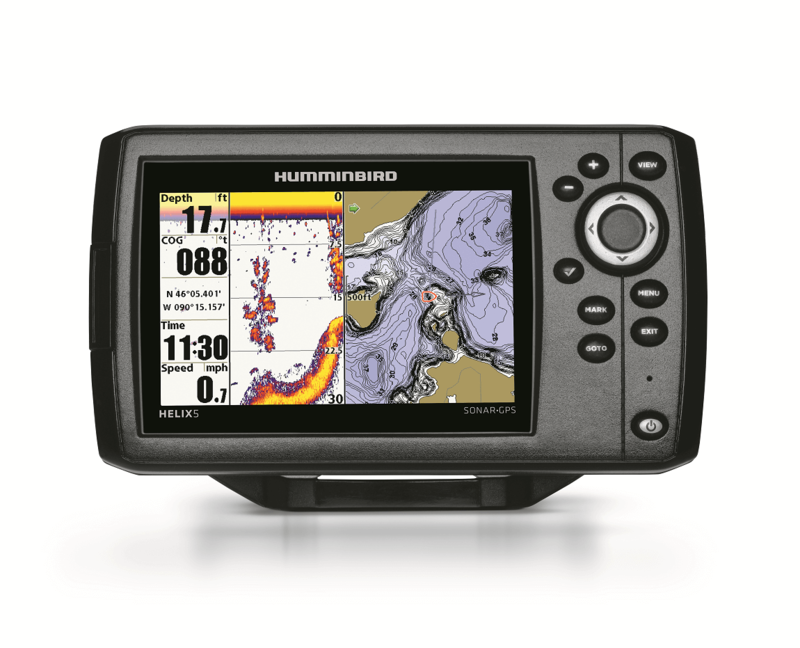 Humminbird is a wonderful brand that features numerous fish finders that suit different needs and preferences. Today we’ll be doing a Humminbird Helix 5 review that shows off one of their smallest products and why it’s surprisingly advanced and quite the find. Since it does lack the power of some bigger models, this is most commonly used by kayakers and people with smaller boats, but its laundry list of features may turn the heads of some people with larger vessels. There are a few models available with different features, so we will describe all of the major features and quickly go over the different models so that you know what you are getting. According to common fish finder naming conventions, any number in the product’s name denotes the screen size, and that applies here with Humminbird. The Helix 5 features a 5-inch display that puts it amongst their smallest products. While most people prefer a 7-inch or 9-inch model, this small form factor is exactly why kayakers and small boat owners love this product. You can squeeze it into tight spaces. You might think that this small screen lacks clarity, but it’s made to be extra wide and has a resolution of 480×800 pixels, which is actually very good for a display of this size. The 256-color display is quite vibrant, making it easy to discern colors and shapes so that you can find good fishing spots. It’s also backlit so that you can see the screen regardless of lighting conditions. The screen is small, but it packs a big punch in terms of vibrancy and resolution. The Helix 5 was known as one of the first fish finders to offer side imaging at under $500. This technology has become more affordable, so there are other options available, but many people say the Helix 5 still does it best. With this model, you get side imaging for a terrain of 480 feet and a depth of 100 feet, giving you a good 180-degree look at everything around your boat. This is done by the sonar pulsing out at 455kHz on each side. Side imaging doesn’t provide the clearest image, but it lets you know if there are some fish around the boat that you should stop for. Seeing what’s right under your boat with extreme clarity gives you a huge advantage when finding fish. This gives you a “fish eye’s” view of the water so you can see exactly what’s done there. Most Helix 5 models come with down imaging technology, allowing you to see high-resolution images that other imaging types simply cannot replicate. It’s perfect if you’re looking for something specific, or if you just want to see what’s right under the boat. A mark of most Humminbird models is their SwitchFire sonar. This tool features two settings to better customize the sonar image. Clear mode, as it sounds, give you better images so that you can make out fish and other small objects. Max mode, on the other hand, works faster and is better for seeing larger, manmade objects or thermoclines. Another hidden benefit of the SwitchFire is its color-coding system. Objects are color coded based on how close they are to your vessel. Orange items are very close, whereas blue items are far away. Don’t like it that way? You can customize the colors to suit your preferences. Most of the Helix 5 models come with CHIRP imaging and DualBeam sonar technology. They are both very different, so let’s get into what makes them both so special. CHIRP imaging is a sonar technology where several waves are used simultaneously and the best image is returned to you. This boosts the overall distance while also improving clarity and making it easier to discern what each object is. DualBeam is another sonar imaging technique that lets you balance distance and clarity. You can choose a narrow beam if you want high clarity but short terrain coverage, or a wide beam for larger coverage at the cost of clarity. Both can be used to give you great images and amazing fishing spots. Perhaps one of the best features of the Helix 5 is the SmartStrike. Certain fish can be found in particular areas based on several factors. The Helix 5’s GPS collects this data and makes it easy to find fishing spots for specific fish. Just punch in season, water body, current weather conditions and the type of fish and the SmartStrike card will go to work, crunching numbers and telling you where that fish will most likely be. This gives you a huge advantage in finding your prey and getting the jump on it. This is a slightly more advanced feature since you’ll need to be specific about the inputted information, but most people can learn how to use this tool in a short amount of time. You can find an internal GPS with most of the Helix models. The GPS allows you to up to 2,500 waypoints and 45 routes, which is pretty good consider its small size. You can also link AutoChart Live to the GPS so that you can create your own special maps and download premade maps to help you find good fishing spots. Along with that, there are several types of GPS maps. There are ones for nearby vegetation, bottom hardness and satellite imaging through LakeMaster PLUS. There are half a dozen models available with Helix 5, but we will quickly go over the three best based on their pricing. 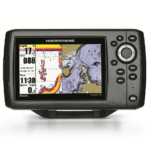 -Affordable: Helix 5 DI G2: Offers Down Imaging along with the dual beam sonar, giving you a good view of everything around you along with the ability to customize the sonar. -Mid-Tier Value: Helix 5 CHIRP DI GPS G2: Much like the affordable unit, you get dual beam sonar and Down Imaging, but you also get the GPS, CHIRP imaging and UniMap for chart mapping. -Premium: Helix 5 CHIRP SI GPS G2: Almost the same as the value one, but here you also get Side Imaging. It’s $100+ more, so this is a good decision if you need Side Imaging, otherwise the value product might be best.